If you email someone, you probably want a reply. And a quick reply would be a plus, too. I enjoy recieving personal emails, but when done wrong, they can be a pain to read and take action on. 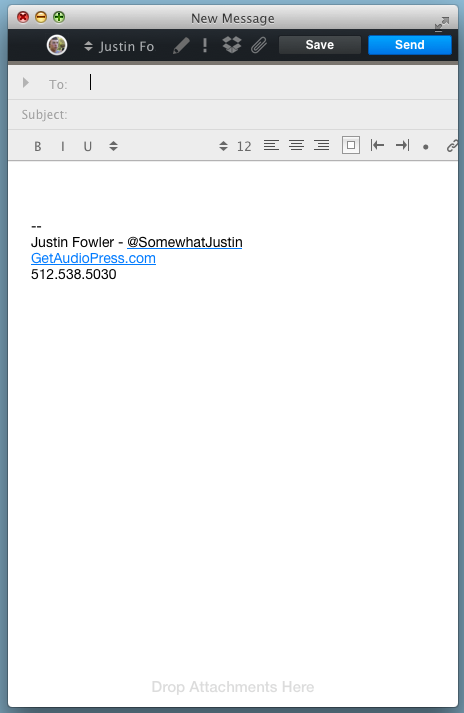 Here’s some tips I’ve tried to make my emails easier to read and reply to. I access my emails on my iPhone all the time. The line width on an iPhone is much narrower than the web version of gmail, or my email client on my 27 inch iMac. Your email could be seen on a variety of screens, so I always prepare for my email to be seen on the smallest one. This means that when composing an email, I change my compose window so that it is as narrow as possible. I use Airmail for Mac, so all I have to do is grab the corner of the compose window and drag it to make my window as narrow as possible. When your compose window is wide, paragraphs seem smaller than on an iPhone, where even a short paragraph can look like a large block of text. By keeping a narrow compose window, I’m able to easily see when my paragraphs are becoming too lenghthy. This paragraph before using Hemingway. 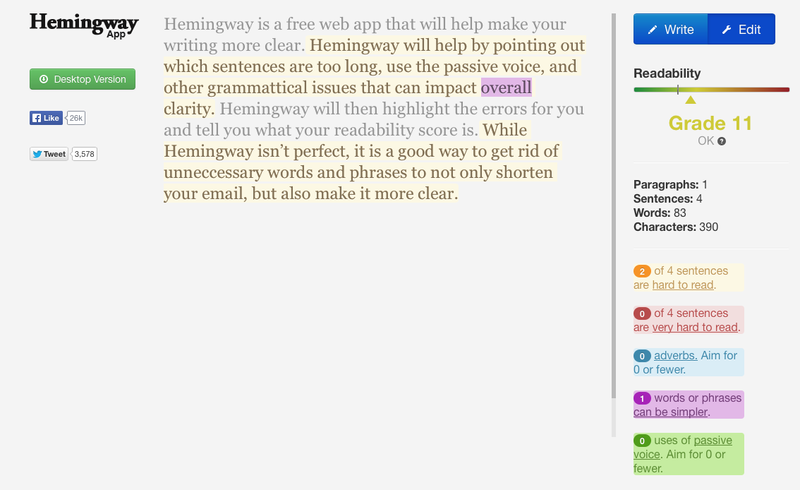 Hemingway is a free web app that will help make your writing more clear. Hemingway will help by pointing out grammatical issues that can impact clarity. Hemingway will then highlight the errors for you and tell you what your readability score is. Hemingway isn’t perfect, but it can get rid of unnecessary words and phrases to shorten your email and make it more clear. When I’m writing an email, I write to get a reply. By that, I mean that I try to fit it only the information that is pertinent without anything that could be extraneous. For example, if you are asking for someone to evaluate your landing page, write a simple email with the request and little background information. You don’t need to include the story of your startup just yet, get a reply first. Don’t try answering a question before it is asked. The person to whom you are writing is trying to evaluate whether or not to respond to your email. Keep your message short to give yourself a better chance. Later on, you may get a reply asking “What is the story of your startup?”, or “What does your code look like?”, etc. Putting too much extra information can cause your email to be ignored. Questions can be answered later. A little extra effort can go a long way. If you don’t get a reply, try following your original email with another email (shorter than the first) as a quick reminder. Jonathan Kim was a gmail script that will collect all the emails you’ve sent that haven’t been replied to after a certain amount of days. You can find the instructions here. I’ve found that when someone is trying to get my attention, I appreciate a follow up. Nobody is perfect, and our email habits certainly aren’t either. Just don’t go overboard with the follow ups. Most of the emails in my inbox right now were sent via auto responders and mailing systems. It’s a breath of fresh air to get a personalized email from a real human, so try to act like a human. I don’t recommend using canned emails to save a few minutes. Instead, craft an email that removes any doubt whether or not you wrote specifically for the reciever or not. To do this, try finding out a little bit about who you are sending your message to. Mention something they posted on Twitter or their favorite sports team. Anything to “prove” that you are personally writing to them. Email is an old system, but still one of the best ways to get in contact with someone. Using these tips, you should see an increase in the amount of people viewing and responding to your emails.